Every year, a few days before Cinco de Mayo, I get a ton of emails asking for recipes to help create a culinary celebration. Contrary to popular belief this is NOT Mexican Independence Day but rather Cinco de Mayo celebrates Mexico unbelievable victory over huge force of Napoleon III army on May 5, 1862, at the Battle of Puebla. Of course I want to pay homage to a country that won an unlikely battle against a much larger stronger force (hummmm sounds pretty similar to a few Jewish holidays I know about) I always say, when in doubt, make salsa. Most of us are familiar with the tomato, onion, chili, and cilantro variety and I had always wondered why anyone would want to put the same old recipe, no matter how delicious, out every time you had the opportunity to “do” salsa arose. 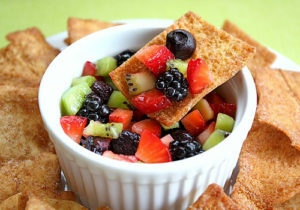 It was about 5 years ago, at an actual Cinco de Mayo celebration that I was introduce to fruit salsa (yes I know the tomato is “technically” a fruit but work with me here) that I became a fan of the variety that lets you create with whatever fruit is in season. Yes, you can still add jalapenos if you want the hot and yes you can add cilantro (I prefer parsley) for a more authentic flavor. 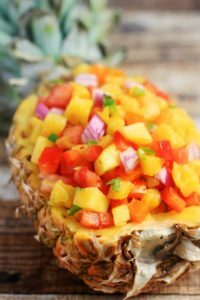 I you want to go the extra mile when serving fruit salsa you can cut a pineapple in half, keeping the top leaves attached, cut out the fruit (leaving a shell/bowl) and serve the salsa in the pineapple bowl. The following recipes are all pareve, more sweet than savory and can be served year around with chips or with fish or chicken. NOTE: Always use a glass bowl when making salsa as the acid in the fruit can react and change the taste if you’re using a metal bowl. EXTRA NOTE: There is a cinnamon crisp recipe at the end of this column that is absolutely perfect to serve with a sweet salsa. In a large glass bowl combine the kiwis, apples, raspberries, strawberries, sugar and jelly. Mix gently and cover with plastic wrap. Refrigerate for 30 minutes before serving for flavors to mix. Preheat oven 350. Place the tortillas on a cookie sheet. Brush the tops of tortillas with the melted butter. In a bowl combine the cinnamon and sugar then sprinkle it over the top of the melted butter on the tortilla. Cut the tortilla into 6 or 8 triangles. Bake for 15 to 20 minutes until bubbly. Remove and cool. Makes 36 to 48 pieces.